Place the fish into the crushed jalapeño cashews to coat. Hold refrigerated until ready to bake. Mix all ingredients together and hold until time of service. Mix mashed avocado with chile lime salt, cover surface with plastic, refrigerate until time of service. Bake fish for 8 minutes, or until cooked through. Set aside. Plate 3 tostadas and top each with one tablespoon of Seasoned Mashed Avocado. 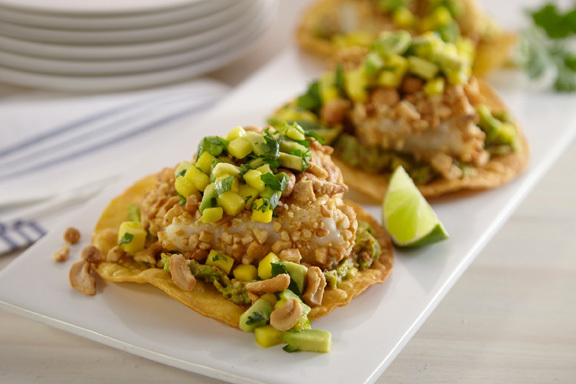 Top each tostada with 1 piece of Jalapeño Cashew Crusted Fish and 2 tablespoons of Mango Avocado Salsa. Serve immediately.